If your Performance Triggers are Active, you can find out when they were last triggered and when we last checked your content. If you want to make sure that your Notifications are firing, navigate to Settings > Realtime Automation & Alerts and then locating the Performance Trigger that you want to monitor. 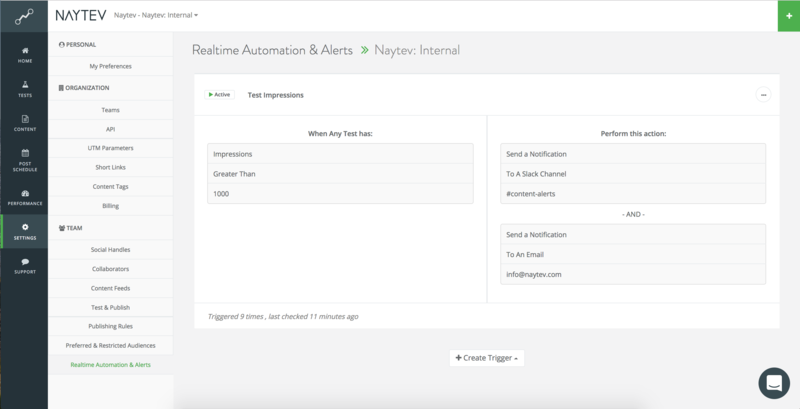 At the bottom of each notification, you'll be able to see how many times a particular action was fired and when Naytev last checked your content. Tip: If you've created a trigger to identify the top 10% of any paid or organic content that you've posted, remember that statistically the trigger will only fire once out of every 10 pieces of content posted.